The day after Otto Warmbier's death, the White House said it hopes China can put more pressure on North Korea. But Trump, in a tweet, seems skeptical. President Donald Trump told Bloomberg News last month he'd be "honored" to meet with North Korean leader Kim Jong-un "under the right circumstances." 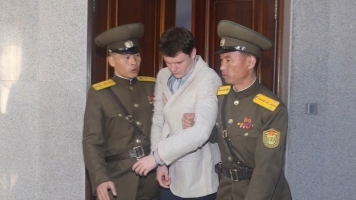 But the death of American student Otto Warmbier — who the regime imprisoned — seems to have changed that. "Clearly, we're moving further away, not closer to those conditions being intact," White House press secretary Sean Spicer said. Earlier Tuesday, Trump seemed to imply the Obama administration could have prevented Warmbier's death. "It's a total disgrace what happened to Otto. That should never, ever be allowed to happen. And frankly, if he were brought home sooner, I think the result would have been a lot different. He should have been brought home that same day," Trump told reporters in the Oval Office. U.S. Secretary of State Rex Tillerson and Defense Secretary Jim Mattis are expected to meet with Chinese officials Wednesday. And the U.S. State Department says North Korea will be a "top priority." "Obviously China can play, has played and can continue to play a greater role in helping to resolve this situation. And we will continue to hopefully build on the relationship and the dialogue that we've had with China. I think there have been some positive steps they have taken both at the U.N. and economically to help strengthen the case against North Korea," Spicer said. But around the time Spicer said that, Trump tweeted he appreciated China's efforts but "it has not worked out."